Kidspert: Pick A Better Time To Poop, Dude! I want you to take in this picture below. 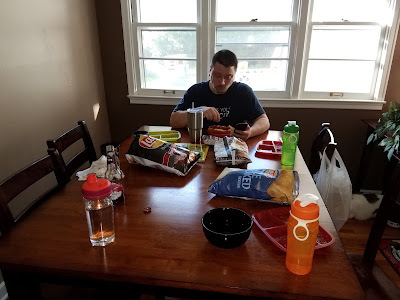 It's my husband enjoying a dinner by himself. Quietly eating, food warm (okay, so it was re-heated but warm nonetheless), beer in hand. Notice all other spaces at the table have been left. Because dinner was over with when he sat down. It must be nice. How is it that husband's have a knack for "needing to poop" at the most in-opportune times? Dear lord, pick a better time to poop dude! I just don't get it. I love you but our children are only going to remember you on the toilet. Is it just my husband?? Or do all husband's have a knack for "needing" to do something at the most inopportune times? So, I asked some of my girlfriends. Actually, it's a discussion we've had numerous times in the past. Apparently my husband is not the only one with bad timing. It makes me wonder, are they doing it deliberately? I hope they have fun catching up on Reddit articles and YouTube videos because my time in the bathroom isn't any sort of relaxation. For me it's more like a race, like a beat your own time type of thing. If I'm gone for longer than 20 seconds I'll have an audience in the bathroom (which quite honestly I'm used to at this point in my mommyhood). But really, do I need to start planning things around this pooping schedule? * Shout out to the Hubs who shrugged when I ran this topic idea by him and said, "I'm sure other husband's will understand me."